Three season hikers looking to expand into winter will find that it takes a lot more gear to be able to hit the trail. 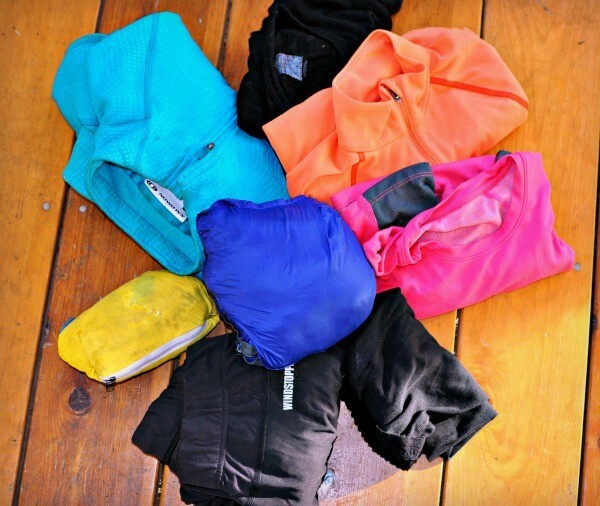 Clothing for hiking is much different than sports like skiing as it’s highly aerobic. You’re consistently moving uphill so the ability to add or remove layers is key. You also much prepare for above treeline conditions. Many of the items I use as my winter hiking gear are unisex, but there are some female specific clothes listed. Links to the men’s version will be included when applicable. On top of having the right gear, you need to have an understanding of how to properly use all items and learn a variety of new skills such as snowshoeing. There are many factors to also consider when hiking in winter such as forest road closures and preferred routes. You can subscribe to our monthly newsletter or follow us on facebook to be sure you don’t miss that post! Just about all of the gear I may take for a day hike in New Hampshire’s White Mountains is pictured above. The one thing not pictured is my ice axe. It’s in a box after moving, but there are only a few trails I would use one on. If you do purchase an ice axe, get one of mountaineering and not ice climbing as they’re different. Also take a course to learn how to self arrest properly. Not everything pictured goes with me on every hike. For example, I research the conditions and track the weather to know which foot traction I’ll need. I’ve separated the gear pictured above into sections and will give you a look into what I use as my winter hiking gear as well as some additional information. My winter hiking boots are Salomon Toundra Mid WP boots. I’ve owned them for four years and am impressed by their quality and comfort. In warmer weather I wear trail runners so switching into boots is an adjustment for me. Mt feet and hands get very cold so these insulated boots are a must. They rated to -40F and waterproof. I’ve worn these with windchill bringing the temps down to -30F with a single pair of wool socks and my feet have never been cold. I wore them on a hike to Willey, Field, and Tom the day after I got them and they were comfortable. They are snowshoe and crampon compatible. I use Smartwool hiking socks. Make sure you wear a pair of thicker socks like these if trying boots on in the store so you know if the sizing is right for you. With these boots I went a half size up. To add a little additional warmth around my lower legs and more importantly, keep snow from entering my boots, I use tall gaiters. For a budget friendly pair, go with EMS Spindrift Gaiters. If you constantly rip your gaiters with crampons, upgrade to the Hillsound Armadillo Nano Stretch Gaiter. Depending on the terrain and conditions, you may need additional traction. 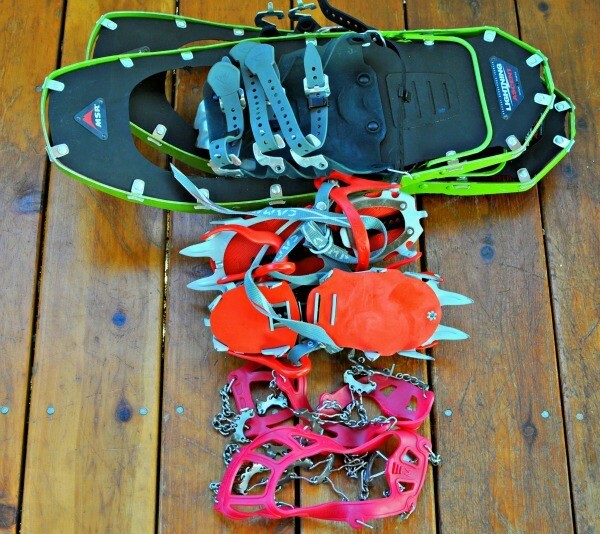 From the bottom up are Microspikes, crampons, and mountaineering snowshoes. Kahtoola Microspikes (pictured) or Hillsound Trail Crampons are extremely handy for hiking in the Whites. They provide a little extra traction with their small spikes that area ideal for trails with mixed rock, ice, and some snow (when you don’t need flotation). I carry my ‘spikes in my pack from November through April. Kahtoola just revamped their Microspikes for 2015 so they are lighter, but more durable. If you run into steep terrain covered in thick ice and consolidated snow, crampons will be beneficial. I will say that 95% of the time I’m either wearing Microspikes or snowshoes, but there are times crampons have proven extremely beneficial such as the steeps going up and down the summits of Lincoln and Lafayette. If you are just getting into winter hiking, I suggest sticking with some below treeline hikes to s become acquainted with the varying conditions before you invest in crampons. 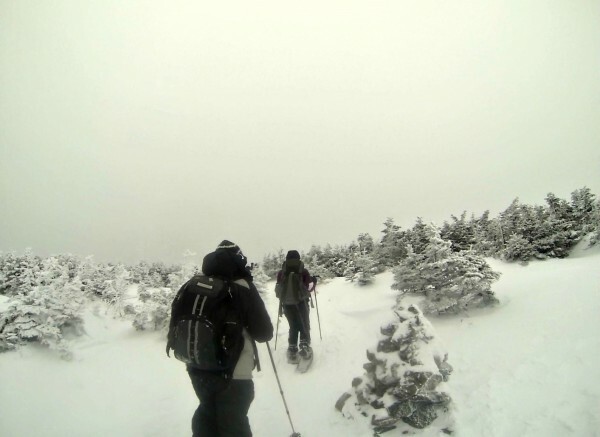 Snowshoes are needed when hiking on unconsolidated snow to prevent you from sinking in. The weight of snowshoes might make you cringe, but going without them when needed causes deep holes (known as post-holing) to be created in the snow which often freezes up in winter, which makes for treacherous trails for other hikers. Snowshoes will help you conserve energy by preventing post-holing, which can cause you to sink into snow up to your thighs or waist. It is important to purchase mountaineering snowshoes which have integrated crampons that help provide traction on ice or packed snow along with the power of flotation. I have used MSR Lightening Ascent Snowshoes for four years and have yet to have an issue with them. 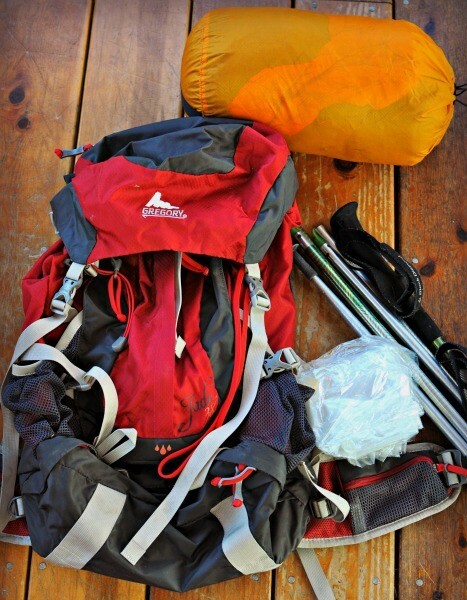 Be sure to add in the weight of your pack for winter hiking when looking at the sizing guide. Ever hear the phrase “if your feet are cold, put on a hat”? It is said that about 40% of body heat is lost through your head. Invest in a quality hat that is made of wool or a synthetic material and covers your ears. The Outdoor Research Oracle Beanie is a very comfortable and warm hat. For above treeline sections, you may need to protect your face from strong winds and below freezing temperatures. I got a bit of windburn on my face a couple winters ago because I didn’t pull out my balaclava. I suggest trying a few options on in stores to see how comfortable/breathable they are for you. I have a Seirus Innovation Balaclava which is a budget friendly option. I don’t find the ventilation exceptional and find it does accumulate moisture. I’ll likely upgrade to an Outdoor Research Balaclava like the Gorilla. Goggles will protect your eyes from harsh winds and snow glare. 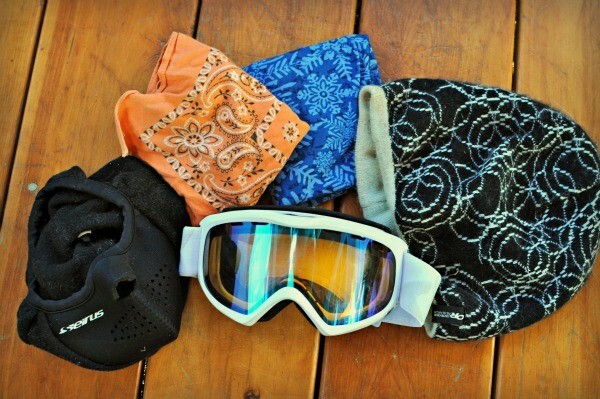 If you’re a skier or snowboarder, you can use those goggles for hiking too! You’ll want to invest in a quality pair of goggles that don’t fog up and have adequate protection. I also like to carry a Buff when I need just a little protection around my neck or face and a bandanna. The bandanna is tied to my pack for easy access to wipe my nose. It does get runny winter hiking! For my hands I typically bring two pairs of gloves and a pair of mittens. I like to bring a pair of thinner bike gloves for warmer winter hikes or if I need to wear them under the mittens on very cold days. Mittens will keep your hands warmer so I like to use them especially when hiking above treeline in cold weather. Below treeline when I know I’ll be taking multiple quick stops for gear adjustments or snack/water breaks, waterproof and insulated gloves will allow you to stay warm while having easier movement of your fingers. If you use trekking poles in winter and need to remove your gloves or mittens, stick your poles in the snow so they’re standing up and cover the handles with your gloves/mittens so you don’t drop them in the snow. 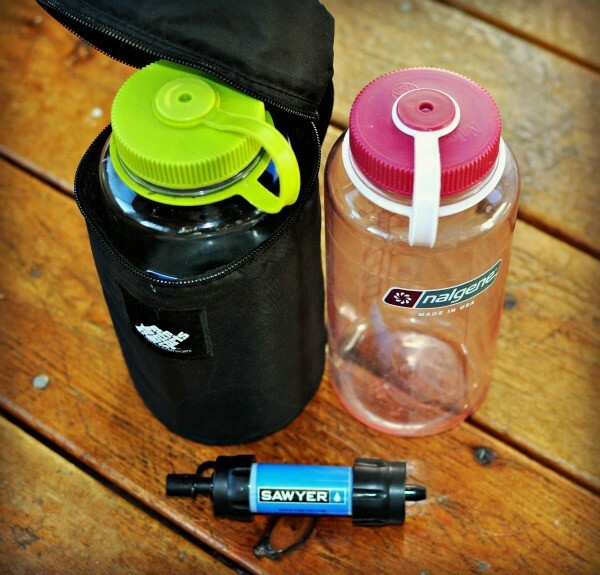 Staying hydrated in winter is a bit of a project, but easily done with the right equipment. I personally do not recommend using a hydration bladder in winter even if you purchase an insulated tube. It still runs the risk of freezing. I switch over to wide mouth Nalgene bottles in winter. EMS sells a zippered insulated koozie that will help prevent your water from freezing. I place the bottle upside down so if anything freezes it will be the water at the bottom of the bottle and it is still drinkable. In exceptionally cold weather, toss a hand warmer inside the koozie. I usually carry two 1 liter bottles for hikes up to 10 miles and an additional bottle for longer treks. You will need to figure out how much water you’ll need for your hikes. You may be able to filter additional water on the trail or melt snow but be prepared to find most water sources frozen and huts closed for the season. If you do bring a filter or Aquamira be sure to keep them warm to prevent them from freezing. Map and compass: Understand the trail you will be hiking and know your bailout routes. You may find blazes (especially along the AT!) hard to follow covered in snow. 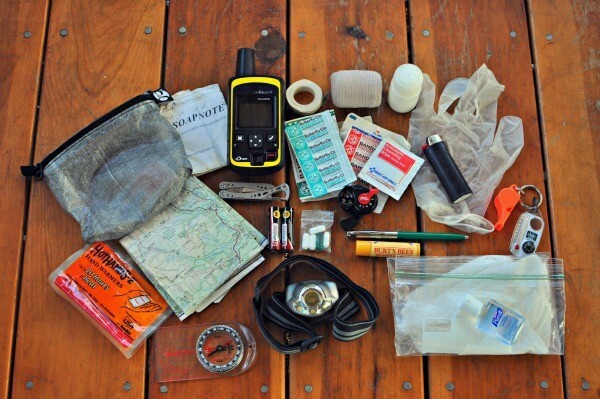 Knowing how to properly use a map and compass could save your life. Derlorme InReach SE: I have yet to use mine in winter (I got it for my JMT thruhike) but it’s not a bad idea to have one, especially if you have friends and family that worry. It isn’t a replacement for poor mountaineering skills. In winter it may take hours or even days for rescue to get you and that’s if the beacon is accurate. Headlamp: This Black Diamond Headlamp is bright and durable. Bring spare batteries as the cold will drain the batteries quick. I like the e-lite as a really lightweight secondary headlamp. First Aid: My kit is simple with gauze, band aids, Ibuprofen, Leukotape, etc. I know I won’t be suturing my arm on a hike so I don’t bring those items. In case myself or someone in my group gets hurt I have a copy of Wilderness Medicine Institute’s SOAP notes to aid in a rescue effort. I also carry an emergency bivvy (not pictured- inside my other pack!) and sometimes a sleeping bag, pictured below. If someone hurts themselves a sleeping bag, emergency bivvy, or space blanket will help them regulate their core temperature when waiting for rescue. I highly recommend taking the SOLO Schools Wilderness First Aid course. Whistle: Make sure to bring a plastic whistle as a metal one will freeze. It will also work better than the integrated whistle now on most packs. Other essentials: bathroom kit (toilet paper, extra baggy to pack out trash, hand sanitizer), lighter, rite in the rain pen or a mechanical pencil, letherman, sunscreen (the sun’s reflection off the snow can give you a sunburn), and chapstick. When you need to head to the grocery store in winter you may find yourself wrapped in a thick sweater, scarf, and puffy jacket, almost immovable, but you don’t freeze in the lot. Many people try and use the same method for winter hiking. After all, you may be spending an entire day in below freezing temps! Once you hit your first steep climb, you begin shedding layers. But what if you don’t have many? You run into issues like overheating. If you sweat on a winter hike and then your sweat is exposed to frigid air and whipping winds, you run the risk of getting hypothermia. Salomon Elevate Mid Jacket– I have a similar hoodless version that is no longer sold. My favorite Salomon Windstopper Trail Tights are no longer made. SmartWool PhD Run Wind Tights are the most similar. I wear an older pair of long underwear that’s I’ve cut above the knee under the tights. I find wearing full length long underwear is too warm for me. Finally I keep everything in a pack suitable for winter hiking. I like the Gregory Jade 38 for winter hikes. The capacity is good for the gear I bring (make sure your pack is large enough to accommodate your gear), is tough enough to deal with the conditions, is easy to organize, and I can strap my snowshoes on the sides easily. I use a piece of Polycryo to line my pack and keep my clothes in stuff sacks to protect them from precipitation. As I mentioned above. I sometimes bring a sleeping bag. Typically I will on longer above treeline hikes. Some choose to bring one all the time. For trekking poles you will want to make sure yours are snow basket compatible. Unfortunately when I purchased my Black Diamond ZPoles four years ago, I didn’t look to see if they were and the tips do not come off so they are unable to accommodate snow baskets. The baskets will prevent your trekking pole tips from sinking into the snow. Basically, acting as mini snowshoes. The last item I would recommend bringing is a sitpad for breaks. You can quickly become chilled when having lunch. I suggest also keeping your breaks frequent but short. Are you gearing up for the winter hiking season? Leave a comment below! 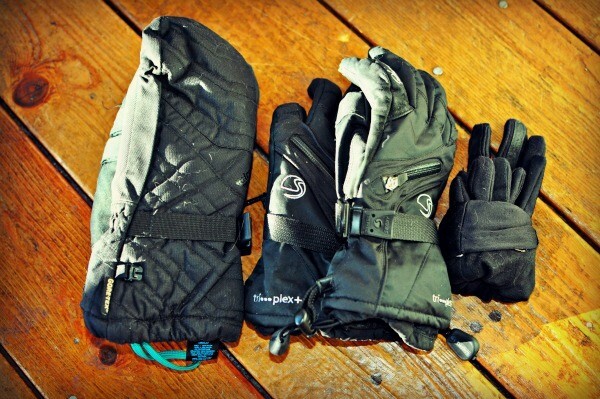 Also take a look at our winter gear guide for even more tips! Thank you so much for this article! I felt so overwhelmed looking at new gear! I’m going to take your advice and purchase the microspikes and ask for snowshoes for Christmas! Any advice on the best beginner 4ks for winter? So glad I could help, Anna! I will be adding a post (hopefully it will be up next week) regarding which peaks are good beginner hikes to start with. I will say, I highly recommend doing a couple smaller hikes (2-3k) with your gear before hiking up a 4k in winter for the first time. Could you also give recommendations/links for men’s gear, especially the clothing. Also, if possible could you also give budget options for clothing like you have done for the other gear. I have already invested in an expensive down jacket so dont want to spend another $500 on other layers. Thanks! Now you know how us gals feel most of the time 🙂 Most outdoors articles tend to be male focused so we run into that issue a lot. For men’s clothing, many of the layers I mentioned are made for men too: EMS techwick short and long sleeves, Icebreaker Bodyfit long underwear, and the Patagonia Midweight top are all great choices. For deals, I recommend signing up for a website’s newsletter to get coupons emailed to you. Backcountry, REI (the outlet site), EMS, and Sierra Trading Post tend to have some good deals. Check out Steep and Cheep for daily deals. You may be surprised to even find nice baselayers at TJ Maxx/Marshalls or Goodwill. I certainly have! Getting the gear you need on a budget is a topic I want to do in the future. I’ll probably have something out over the winter on this. Thanks for the comment! Thanks for the added info, I just realised the craziest coincidence. I have only done one hike in the winter and that was with you as leader two years ago when we did Pierce but could not do Eisenhower due to white out conditions. Also, this is the first of your blogs that I have read. Today, I just happened to look at the image you have put up more closely and realised that it is actually me!!! (in the limited visibility above treeline pic). It’s incredible. I recognised it by the poor quality of hiking gear that I have on, not a good example at all for this article :). Hey, everyone has to start somewhere. You can’t see the contents (or perhaps lack of contents?) in your pack, so it’s all good 😉 Glad you discovered Trail to Summit! See you on the trails! Great article, lots of information. Thanks! I just shared this with my girlfriend who will be joining me on some winter hikes for the first time. Extremely detailed and really helpful to get her gear completely squared away. Great article! Great article Allison! I’m hoping to come to Concord Library this week for your presentation if my schedule permits. Hiking Moosilauke tomorrow with a small group of people. I feel pretty good about my gear (still need to invest in snowshoes/crampons), but feel a little more concerned about food – if I’m bringing enough/will I eat enough/will it freeze. What are your favorite winter trail snacks? Thanks, Jen!I’d grab the snowshoes sooner than later. REI has a great sale on MSR right now 🙂 For food, I will actually toss some items in the freezer to see if it’ll last on the trail if I’m not sure. I really like bringing tuna and avocado or egg salad sandwiches/wraps as they would typically go bad in the summer and are a great source of protein and fat. PROBARS tend to do well in the cold, but most bars get rock hard so careful there. Trailmix is still good, dried fruit, peanut butter m&ms (my favorite! ), peanut butter and nutella sandwich, soup/hot chocolate in a thermos (bring a spoon if it has pieces that will get stuck at the bottom). I also suggest adding electrolytes to your water. I like Nuun tabs. Hope you have a great hike!! Thank you and thanks for the tips! Thank you for all the information I am moving into Winter hiking this year and found the article very helpful! I was wondering about the down jacket sizing – do you buy it larger than your typical size so it can go over all the other layers (including the mid layer jacket) or is it your typical size and you either pick the down jacket or mid – layer jacket? Also under what conditons do you switch from a three season boot to the insulated boot? For footwear, I find myself switching to winter boots typically in December. If there’s enough snow to get inside a low boot or would soak through, it’s time to switch. 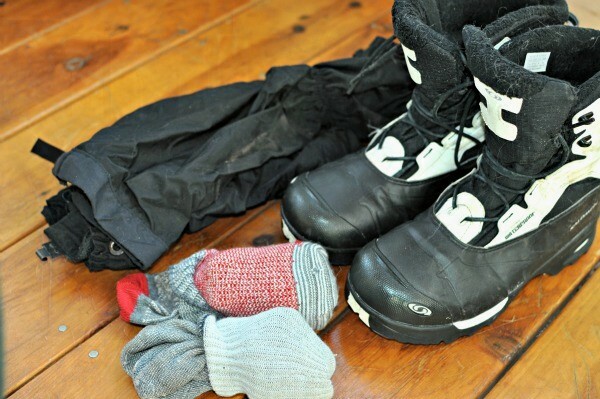 You can use wool socks and warmers inside your current boots if there is only a dusting of snow, but once there’s a bit of accumulation, it’s time to switch. I have a question about snowshoes. I just got a pair of MSR Lightnings for Christmas, and my husband accidentally ordered the men’s version. In your opinion, is it worth sending them back to get the women’s version? The only difference I can see is that the women’s version supports a narrower gait. I’m a three season hiker but don’t have much winter experience. I’d like to start getting out more in the winter but will probably start with some of the mountains on the 52 with a view list…if we ever get some snow! Such a great article! I’m preparing my gear for this winter and this is definitely helping – thank you! You post great and essential article for me and hiking lover. I love hiking and also my family. Me and my family ready to next tour. Thank you for your information and i content you.